Observation - pond dipping first newt - UK and Ireland. Description: Spring is here! Sunny day the children found five male and a female smooth newt. ID tip from little people spotted belly and looks like a dragon. Spring is here! 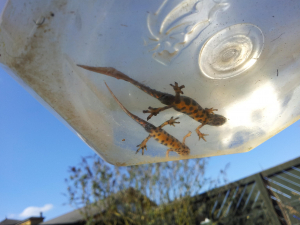 Sunny day the children found five male and a female smooth newt. ID tip from little people spotted belly and looks like a dragon.